Wedding planning is always tough, but the lovely Belle Bride Fiona aka Green Loving Girl has had a tough month, including the challenge of one of her little ones getting hospitalised whilst on holiday in France. Lots of love and wishes going out to little bambina and Fiona, get well soon! 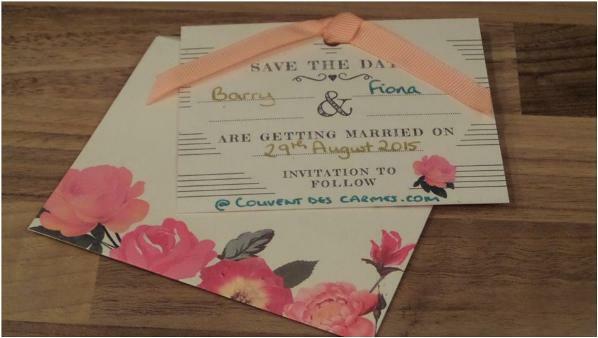 However before this Fiona had been working away sorting out her destination wedding stationery. Fiona: “So when I last left you, we’d booked the venue… have you seen the photos yet? Everytime I look at them I get really, really excited!! My brother was also in the area recently and sent me more photos of the venue, and I really do fall in love with it all over again every time I see it! 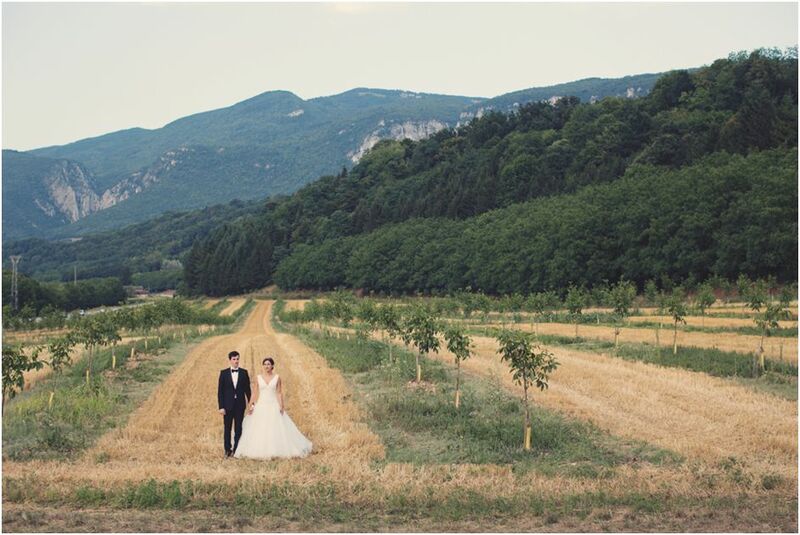 From there we were then able to book our wedding photographer, Anne-Claire Brun. I have to say, once these items were booked, we definitely felt like a big weight had been lifted and we were able to relax a bit more. We decided to send out our Save the Dates pretty quickly after booking our venue. Even though at the time we had almost 18 months until the big day, we do realise that we are asking a lot from our guests. Not only are we getting married in France, but the South of France. In August. This means that people may need to take time off work at a busy time. They will need to travel either by plane, train or even car. They will have to find somewhere to stay as sadly, as stunning as the venue is, the main downfall about it is that it does not have any accommodation on site for our guests. But hopefully this means that they can choose where to stay depending on their budget and needs, and truly discover different parts of the region. A lot of friends also have mortgages/small babies/not so small babies/babies on the way/simply not much money, so we wanted to give them sufficient notice of where the wedding would be, so they could work out early on whether they could afford it/save up in time in order to attend. These were concerns we have had from the beginning about getting married in France, but ultimately, we are extremely excited that we will get to share what we love about the region with our nearest and dearest, so we don’t regret our decision. We are however keen to ensure that we assist our guests by providing them with as much information as possible to assist them with making their trip. A lot of our guests have also said that they would most likely take the opportunity to turn their stay into a holiday while they are there, so I do want to put on a good show and really show off my home place to them all, especially as some of them have never been to France before. First step, was sending out Save the Dates. Barry and I agreed that our priority was to send out the dates for people to put in their diaries, and we can then sort out more detailed invites if we wished. Lucky we did too, as many of our close friends were already getting booked up for that summer, and one of my oldest friends already has a wedding that same day. So we wanted to get in there quick before other people couldn’t make it! After hours searching online for inspiration, we found a few we liked from proper professional ones, creating a postcard with a photo of the venue, having some done in the style of “le Fabuleux Destin d’Amelie Poulain”… But nothing we fell in love with or that didn’t require hours of work and/or a fairly big budget. Barry is a keen gardener, and loves vintage looking drawings of flowers, as you often see on Royal Horticultural Society books. I wanted something bright, colourful and fresh looking. Eventually, I found some on Paperchase, which I really liked. They were simple, yet seemed to include most of the detail we liked. And also, they were a lot cheaper than most of the cards we’d seen online. Bargain! The following day I went to check out the cards “in the flesh” and thought they were perfect, so got a few packs, along with a gold pen (symbolising Barry’s love for gold, shiny objects) and a sparkly emerald one (for me… obviously). And after an evening of joint effort writing them out… Voila! It felt really exciting sending them out and hearing from our friends and family when they received them, the wedding definitely seems more and more real! 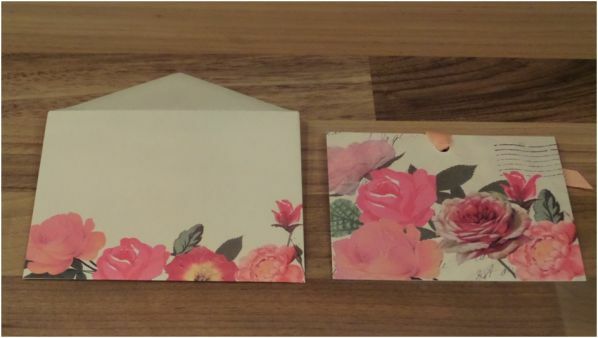 Bride Hollie C recently wrote a post about invites too, as I think we are getting married around the same time. She decided to simply send out the invites a lot sooner, rather than just Save the Date cards. Thinking about it now, that makes a lot more sense and we probably ought to have done the same… We did include the website of the venue as a hint on the wedding location, but not sure everyone got it. 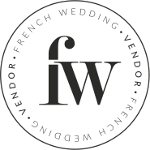 Another great idea from Hollie C’s post is to create a wedding website. As much as I do love good ol’ fashioned paper invites, having a website as well sounds perfect for being able to put in all the “boring” information concerning accommodation, travel tips and other needed information for our guests to make the trip to the Alps, without having to include all of this information in an abundance of pages along with the invites. But first of all, we need to carry out some extensive research into the information we will be providing to our guests, and we simply have not had a chance to sit down and go through it all this month (where has June gone!?). Don’t forget you can follow each of the Belle Brides as they plan their upcoming weddings Hollie C, Cassie and Cyndie and you can find all the Belle Brides past and present here.